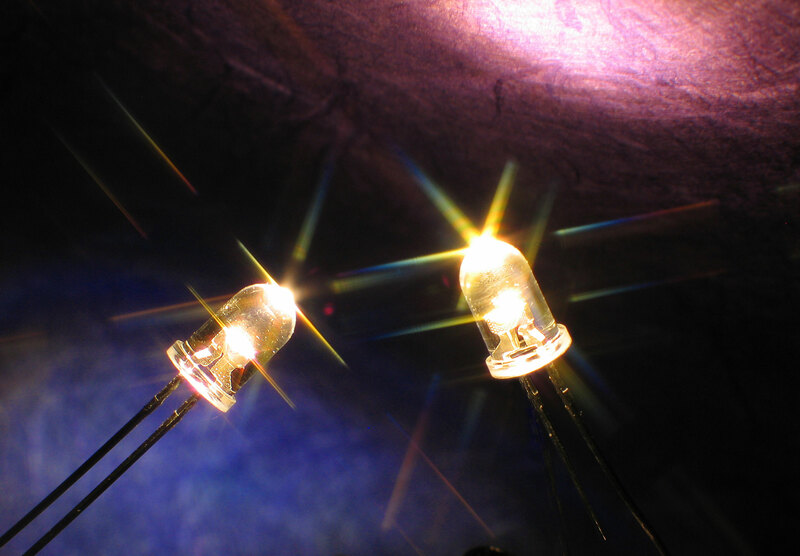 Emitting a warm, incandescent color (3000K), the L200-XIW series Super Bright LEDs put out 14,000 MCD, three times the light of standard LEDs, while running on only 3.2 to 4 V dc. The LED comes in a standard 5-mm water-clear, dome lens housing that allows for a 20° viewing angle. Other viewing angles are available for OEM customers. Their size and brightness, along with the warmth of the light emitted, make the L200-XIW series well suited for applications replacing incandescent lamps. Typical applications include mini lamps, standard electrical-based bulbs, displays, theater décor bulbs, telecommunications data products, push-button switches, safety area lighting, street lighting, medical equipment lighting, or any other area where the 3000K color is desirable. With an average life span of 100,000+ hours, LEDs operate more than 20 times longer than the equivalent incandescent lamps, produce almost no heat, and require 80% to 90% less operating power. Price for super bright L200-XIW Series LED is $18.00 for a package of 10 LEDs. Large quantity discounts are available. Availability is stock to 4 – 6 weeks for special requirements. L200-XIW Series LEDs carry a 1-year limited warranty. For additional information on how to incorporate LEDs into your product designs, contact LEDtronics toll free at 1-800-579-4875, telephone 310-534-1505, fax at 310-534-1424, click here to email us or mail at LEDtronics Inc., 23105 Kashiwa Court, Torrance, CA 90505.